You’ve just got your 360° back. You’re brilliant, a star performer, stunning results, one to be watched. But then you didn’t get the role. The one you were absolutely sure was yours. The one you were almost promised. They told you it was only a little thing, not a major issue, just a small outlier item. That’s right, on every other measure of your 360° feedback, you’re a fantastic leader. But for some reason, you’re not collaborating across the total business. You’re doing your own thing, stuck in your own world, making your own numbers, looking after your own team. And by the way, they love you, your own team scores are fantastic. But you know what, it’s this very behaviour that’s derailing you. It’s your single focus on your team, your performance and your results. It’s causing you to feel static and not get the nod to that next role. It’s your “Collaboration Collapse”. That’s the problem. What do you mean by derailing? You didn’t get the promotion you wanted. You’re like a religious holiday. You keep getting “passed over”. You literally go off the rails. Drink, drugs, dragging the chain, no energy, no hope. Sick and tired of being sick and tired. What happened to all that potential, all those possibilities. Well, you could go backwards (and there’s a time for that). Look at how your parents divorced, how as the eldest, you had to bring up your other three siblings, how you had no time to look up and smell the roses. Or was it the marriage break up, three years ago, that drove your trust levels into the ground? Yeah, we could go on forever but it’s really not going to get you anywhere. iii. Greater meaning and joy in your work? iv. Stunning functional and whole organisation results? v. A brilliant reputation as a leader? vi. A greater sense of purpose in your work? vii. Relationships that last a lifetime? ix. The best feedback and personal development you’ll ever have? Ok, how do I get to play? There are many paths to the Crescendo of Collaboration. For now, here are four simple strategies that have helped the thousands of leaders I’ve worked with over the years. That simple. The reason you’re not collaborating is that it’s not a priority for you. You say you’re just too busy. I say BS. It’s just that collaborating is not on your TO DO LIST. It’s not TOP of the POPS, Numero Uno, your #1 Priority. Decide, for at least the next three months, to be “THE WORLD’S BEST COLLABORATOR”. In the BlessingWhite Leadership Development Programme “Why Should Anyone Be Led By You? What it takes to become an Authentic Leader”, we go into this in a little more detail. 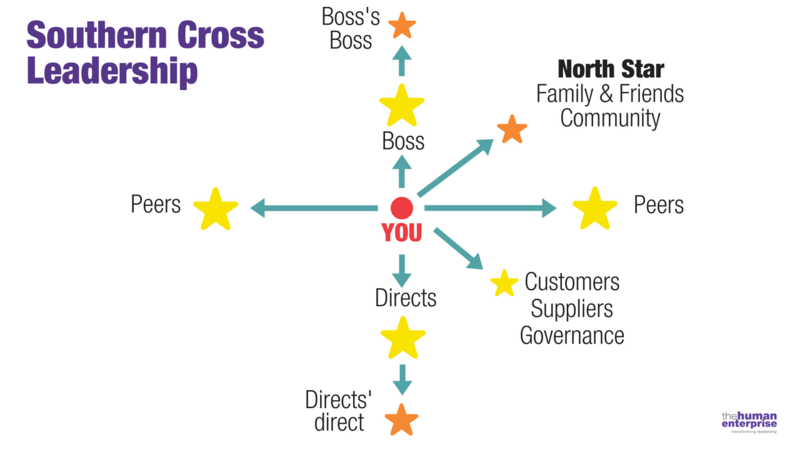 In summary, get yourself in the middle of the Star Formation of Southern Cross Leadership. This immediately gives you the stakeholders you need to be collaborating with. Below is your Directs or your team: a no-brainer. Above you is your Boss: Another no-brainer. Either side of you are your Peers: Now this needs more focus. A lack of peer collaboration and partnering is often a major derailer. The star above your Boss, your Boss’s Boss: Very important. And finally (and for me the most important), the North Star: family, friends and community. Start with one group. I usually don’t recommend you focus on your own team. That will happen almost automatically. In Patrick Lencioni’s Five Dysfunctions of a Team, he talks about the decision of which is your “primary team”, the one you lead or the one you are a member of? If you want to be (and be seen) as a better collaborator, then make your #1 team the team you are a member of, not the one you manage. Put as much energy into collaborating with this team as you do you your own. My BIG bet, however, is once you have ritualised one on ones with your directs, start pro-actively diarising time with your peers. Never underestimate how simple this strategy is. Maybe start with once a month, a one on one with each major collaborative stakeholder, done on a regular basis. And put it in the diary as a priority. The regularity is just as important as the commitment. Your focus should be on three things. Just do an E.D.I. One of the human enterprise’s old favourites. Simply put, an EDI is a method of doing a process check. It stands for: What is Excellent? What needs Development? And What Ideas do we have? Here are some example questions you could ask. Make active Collaboration a priority to you. Work your own Southern Cross. Diarise one-on-ones with regularity. Start with your Directs then, and very importantly, your Peers. 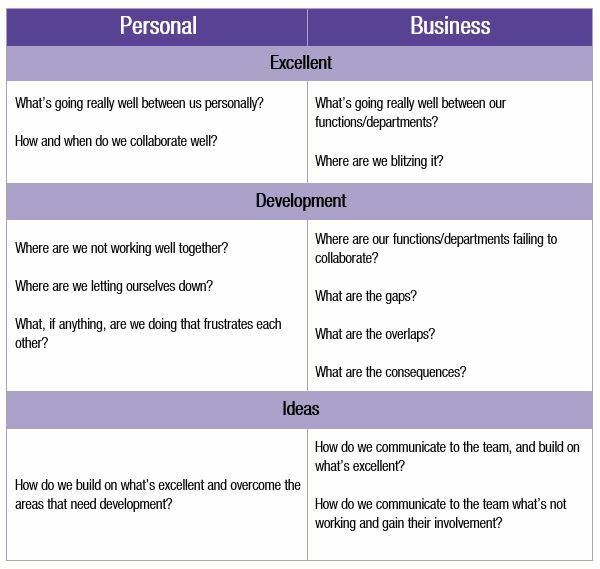 Focus discussions on asking what’s important for them and how to get behind them, while simultaneously expressing what’s important to you and asking them to get behind you. Please, let me know how you go. Send me a Linkedin message or email me on paul@thehumanenterprise.com.au I love hearing your feedback and stories. Before I go, most of our ongoing work comes from sharing the love. 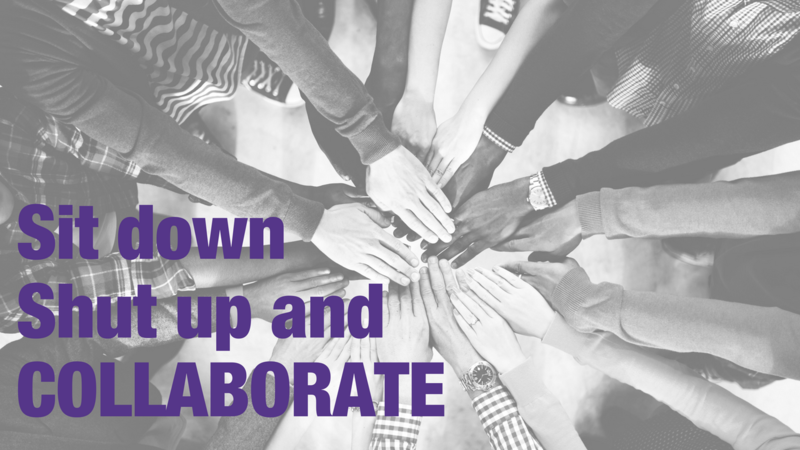 Know someone who would appreciate being a better collaborator? Then share this article with them. Post it to your team on LinkedIn or wherever you like to collaborate.